Arsenal has been poor away from this season but Alexandre Lacazette has however said that they can get a win in the home and away leg against Napoli. Arsenal was drawn with Napoli in the UEFA Europa League quarter finals and the first leg will be at the Emirates Stadium today and Alexandre Lacazette has said that the gunners will need to work hard to get a result in both of the legs despite their worrying away form. Arsenal has been very poor away from home this season and it’s not long since they lost the first leg of their UEFA Europa League ties against BATE Borisov and Rennes. This set of poor results has made the Arsenal supporters to feel very worried ahead of their match against Napoli because they will need to win with a huge margin at home and then go to Naples with more confidence. 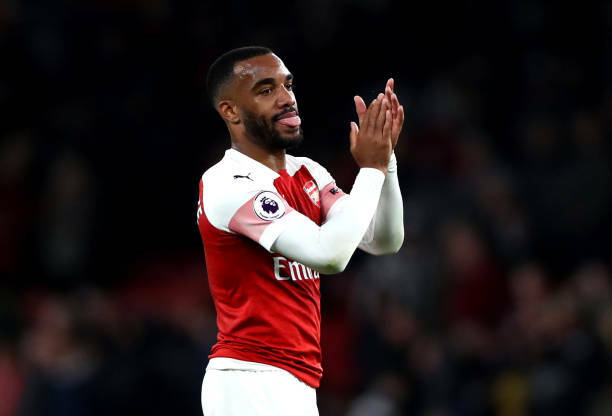 Alexandre Lacazette has been impressive for Arsenal in most matches at the Emirates Stadium and the Frenchman has spoken out about their away form ahead of their upcoming match against Napoli. “We know we are better at home than we are away, so tomorrow is really important for us. We also know we can get a good result away, so both games are going to be important for us.” Lacazette told Arsenal.com yesterday. Arsenal comes into this match after a defeat to Everton and everyone will be looking to see who wins in this match because both of the clubs are favourites to win this year’s UEFA Europa League. The Arsenal fans would be extremely happy if the gunners won the first leg because they believe that their squad will struggle in the second leg against Napoli.